I was trying to find different way to use some Sashay yarn I had laying around. I made a sashay yarn scarf and then a toddler skirt and wanted to try something different. 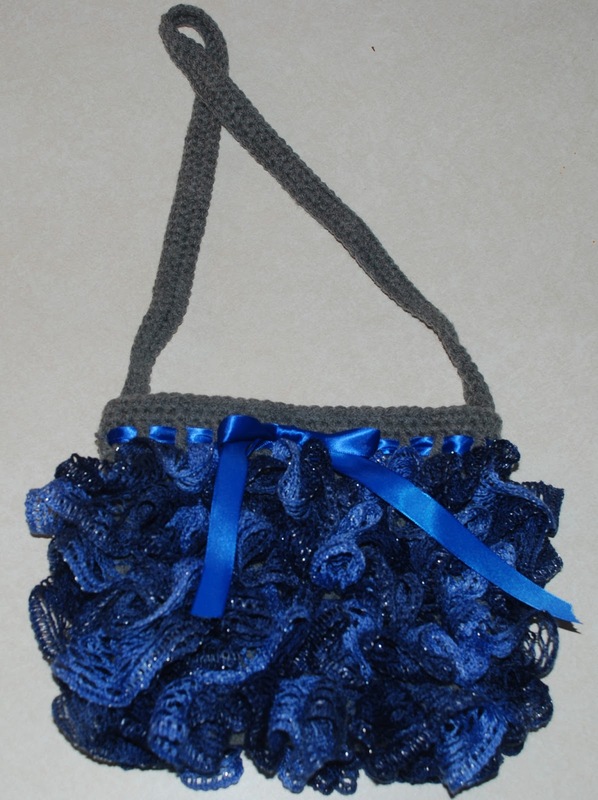 I was searching some yarn crochet sites and saw a cute ruffle Sashay purse crochet pattern. 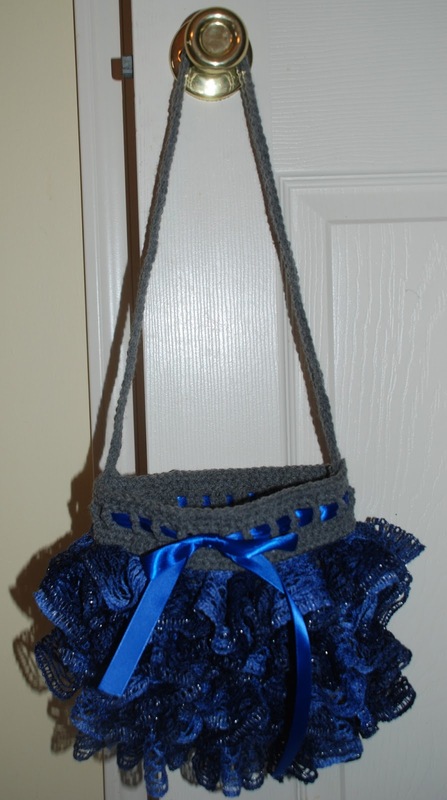 So after some trial and error, I made this cute purse crochet pattern. I have received so many compliments when I use this cute crochet purse. If you would like a bigger, wider purse, then add more chains. Chain 25, G hook with grey yarn. Rnd 19. ch 3, triple crochet in each stitch around, sl st, -65 triple crochet, this will be belt loop for your ribbon. Rounds for Sashay purse: f hook with sashay yarn. Rnd 6. start in round 6 for ruffles. *Create the Sashay Ruffle on hook first to start, by folding the yarn inward about an inch, and inserting hook in the 2nd loop from the beginning of the fold. Skip two loops on the sashay yarn, insert hook in the 3rd hook on the yarn and pull through the loops on the hook. Rnd 7. Skip this row of back loops, then start a row of ruffles in the next row of back loops. I love this purse! It's so pretty! in rnd 2 you say>>>Do not turn, work on the opposite side<<<I do not understand what this means do you have pictures or video? Hobby Lobby sells it as Chrysalis brand. It works PERFECT for all projects and comes in a bunch of colors and they seem to always have plenty in stock! Ebay has a ton and they have colors even the stores don't have. Also look up Starbella and Rossetti yarn on Ebay. There is quite a variety. The Rossetti yarn comes out like a lei. It's very pretty. Good luck. Joann fabrics and A.C. Moore have tons of Sashay plus other ruffle yarn brands. Look for coupons too cuz there's typically one you can use. I've found a place online that has a huge selection of different types of ruffle yarns - all are incredible. The site is www.iceyarns.com and the items come from Turkey, but you can buy in bulk at incredibly reasonable prices. I don't understand your gauge . How long is the piece after the first row? 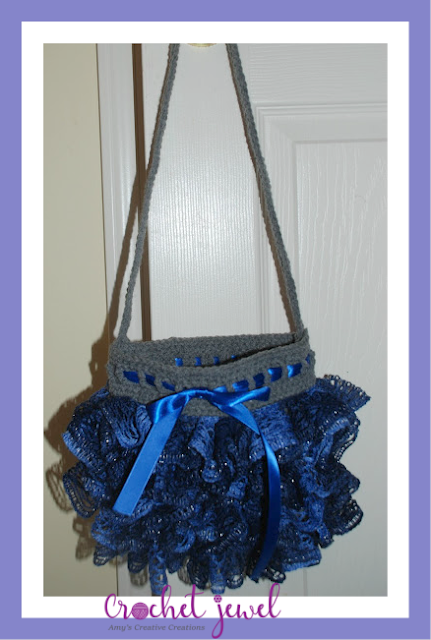 What is the size of the completed yarn purse before ruffle? I love this purse, but have no idea what the dimensions are. How large is it? Without that info I don't know if I have to alter it to make it larger/smaller. TIA. Just curious, I have a bit of a deadline. Does anyone know about how long it takes them to make this small purse? I think about a couple of hours or so. I want to make a bigger purse. I have 90sts in the round on rounds 6-15. I was wondering if your size used the whole skein of sashay. Did you have any left over? Just need to know so i can adjust accordingly. Thank you. I wish I knew, I made that purse awhile ago, I want to say yes I had sashay yarn left. I have been looking for this pattern but I'm a little confused. It stops at row 15. Does that mean that there isn't any more rows after that? Also, do you just connect the bottom of the skirt to make it into a purse? I'm sorry, I'm a little slow.